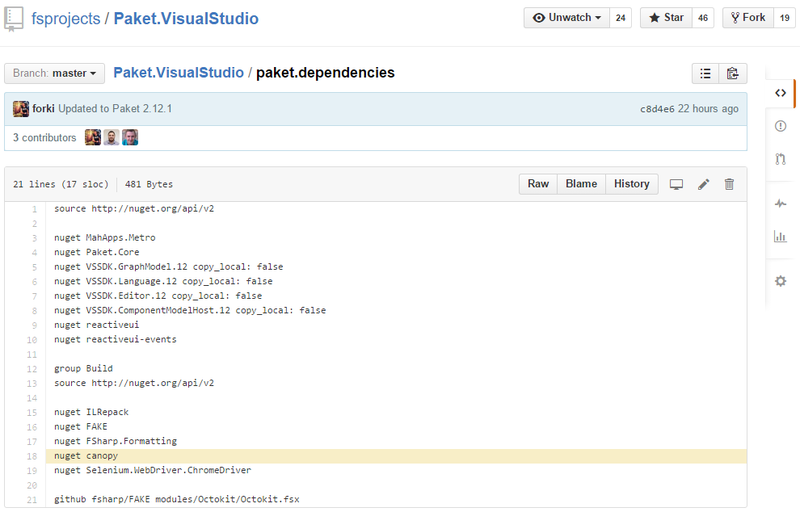 PaketÂ is a dependency manager for .NET with support for NuGet packages and GitHub repositories. 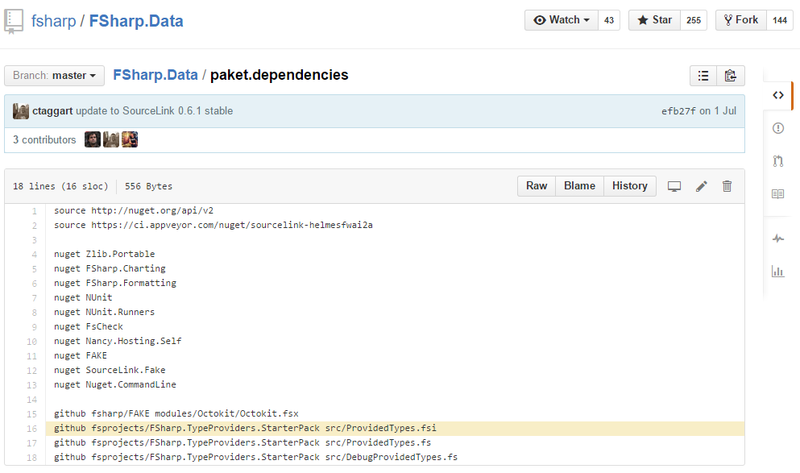 It enables precise and predictable control over what packages the projects within your application reference.Â If you want to learn how to use Paket then read the “Getting started” tutorial and take a look at the FAQs. Asynchronous Workflows are a very old F# feature (they already shipped in 2007) andÂ they areÂ used in many places in Paket. In this article I want to highlight one of the nice applications that F#’s async model allows you. Many readers are probably familiar with C#’s async and await keywords (IIRC released with C# in 2012), but F#’s async feature works a little different.Â You can read more about some of “Asynchronous gotchas in C#” in Tomas Petricek’s excellent blog post. Most of these gotchas come from the fact that C# is starting all async tasks automatically while F# wraps the logic in data and allows you to run it explicitly. For a really good introduction to asynchronous programming with F# I can recommend Scott Wlaschin’s blog post. List.tryPick returns the first result that is not None. So instead of nesting multiple match and let! expressions we use a higher-order-function to encapsulate the same pattern. After using this code for a while in Paket we noticed that different NuGet server implementations each implement a different subset of the 4 protocols and differ very much in the response times. So there was no order of the protocols that would work good for all server implementations. But what if we could query all 4 protocols in parallel and just take the fastest response? The change is relatively easy and we can rewrite theÂ GetAllVersionsÂ as:Instead of running the web requests synchronously and in order we run the four web request per NuGet feed in parallel and take the first response that is not None. cloudÂ is a computation workflow builder and allows you to run your computations in the cloud. InÂ contrast to async we don’t only control when something gets executed but also where. They even have a Cloud.Choice, which allows you to run tasks asynchronous in the cloud and take the first succeeding result. Btw:Â async and cloud aren’t language keywords like C#’s async and await, but implemented as normal F# code in libraries. If you want toÂ define your own computation expression builders, then the MSDN docs are a good starting point. Vor acht Jahren gab es die erste Ausgabe der (Un-)Konferenz mit dem Namen Developer Open SpaceÂ und sie findet dieses Jahr vom 16.â€“18. Oktober 2015 in Leipzig statt. FÃ¼r mich nach wie vor die beste technische Konferenz in Deutschland.Â Die Fotos von der Konferenz sprechen fÃ¼r sich. Die Anmeldung ist seit einiger Zeit mÃ¶glich. Die PlÃ¤tze sind begrenzt. Nimm teil! 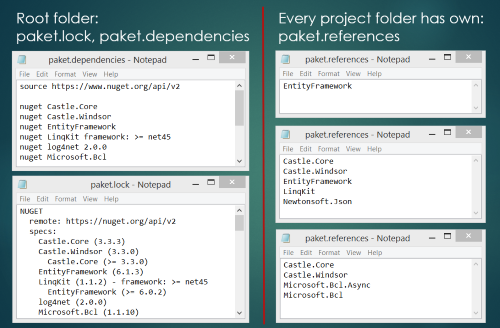 I created a short presentation for our new .NET dependency manager Paket. It’s created with FsRevealÂ andÂ MIT licensed. Please feel free to use/modify it for your own presentations. 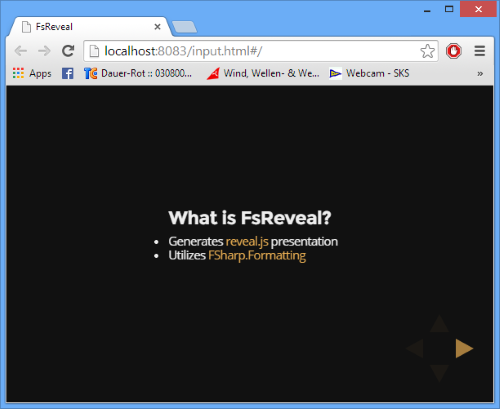 This FsReveal tool stack allows you to write beautiful slides in MarkdownÂ and brings F# to the wonderful reveal.js web presentation framework. Slides workÂ on mobile browsers. Swipe your way through the presentation. Just follow the getting started guide atÂ http://fsprojects.github.io/FsReveal/. 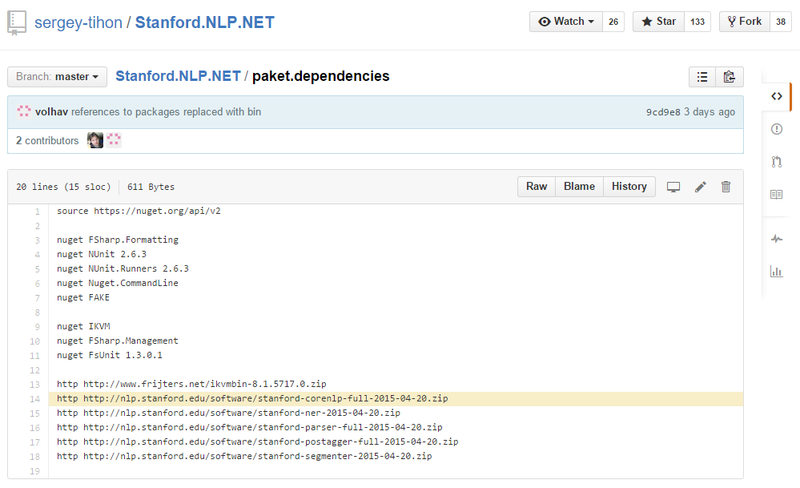 Paket -Â Dependency manager which retrieves the referenced NuGet packages and reveal.js. FAKE – Build tool which allows to orchestrate the slide building process. 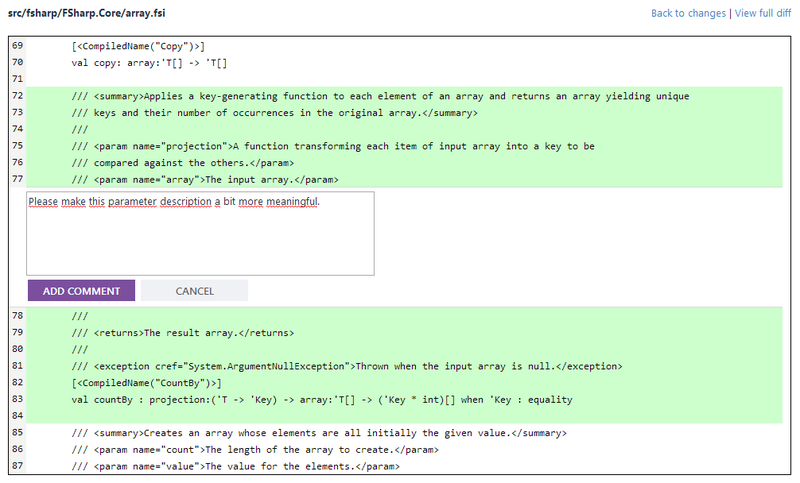 FSharp.Formatting – Used to render markdown slides and for F# syntax highlighting. 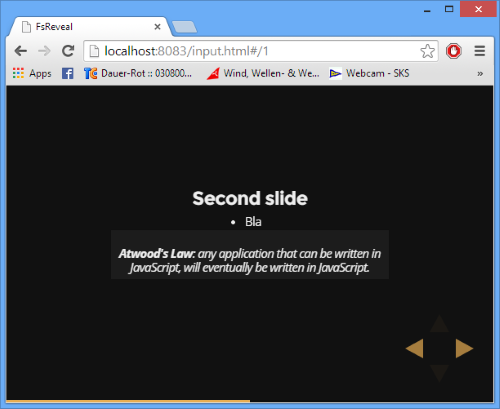 Suave.io – Simple web development framework/ webserver which allows to host the slides. git – Allows you to bring your slides under version control. All of this is bundled in FsReveal, which was originally created by the amazing @kimskÂ (Karlkim Suwanmongkol) and is now part of fsprojects. 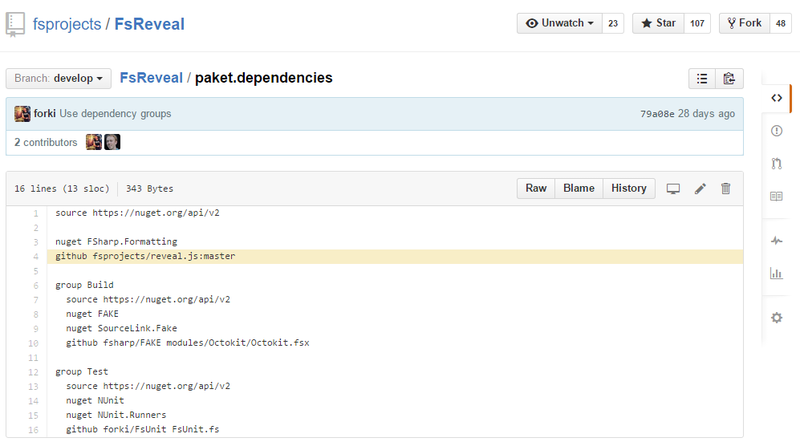 A couple of weeks ago we started the Paket project which is released on GitHub. Unfortunately GitHub doesn’t provide any download stats in the UI. A quick look at the REST APIÂ docs shows that we can retrieve theÂ numbers via JSON. 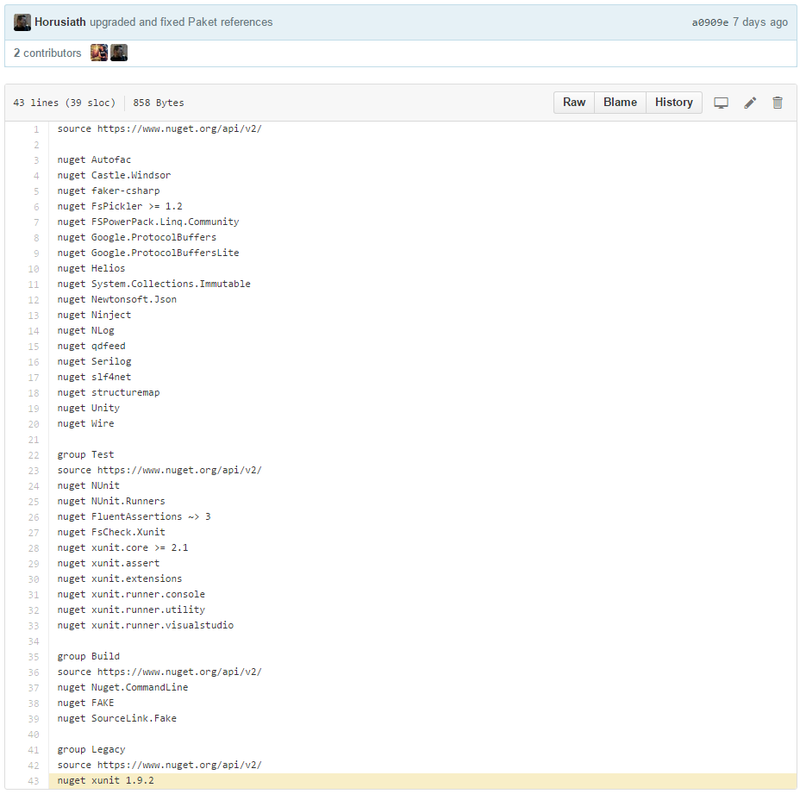 Personally I sent 29 (mostly small) pull requests to the Visual F# project. 5 pull requestsÂ already got acceptedÂ and 15 are still under evaluation. Â In principle theÂ development process seems to be working very well. Especially in the Visual F# project Don Syme and the Visual F# team are doing an excellent job to encourage the community. They are marking user voice issues as “approved in principle”Â and even provide detailed documents for implementation tasks (See CoreLibraryFunctions). 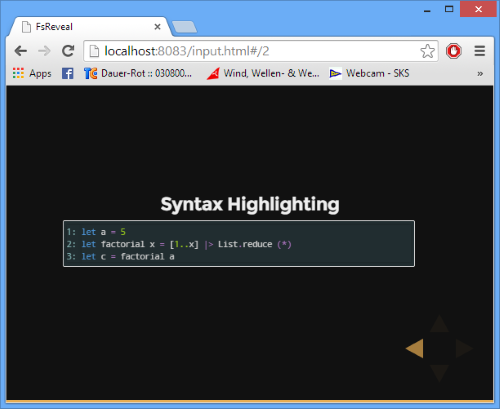 This makes it very easy to get started and to hack a bit on the F# compiler. A big thanks to you guys. A very important part of the open source is the review process. The F# community is awesome in this regards. On issues like a new “compareWith” function I got comments with remarks about coding style, test cases, documentation and lots of new ideas about possible performance improvements. It’s really exciting to be part of such an active and welcoming community. There is only one “but” and this “but” is the choice of the development platform. I really think CodePlexÂ is hindering these projects to become even more successful. 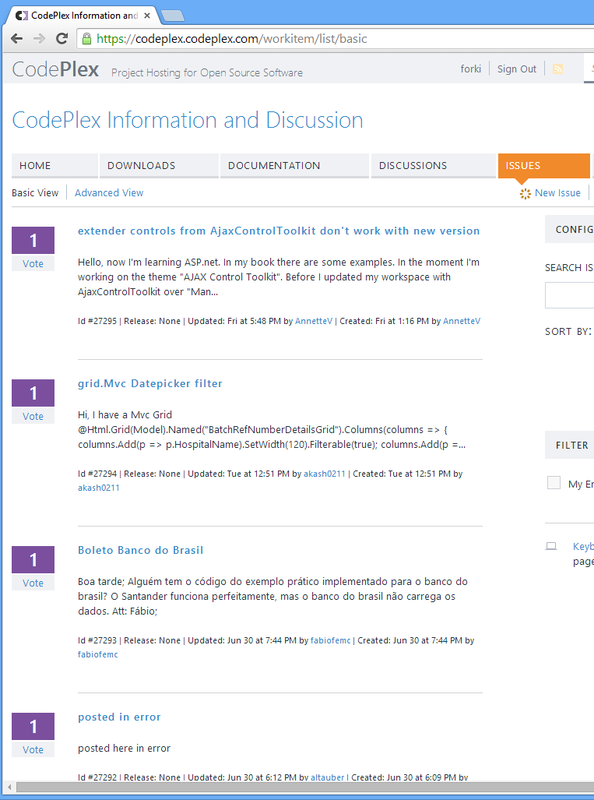 In this post I want to show some of my experiences with Codeplex. Remember I already sent 29 pull requests so I think it’s fair to say I tried! The first impression on the Codeplex site is that every click feels so frustrating slow. Waiting 4s and more for a site to load doesn’t exactly feel like 2014. Things like this make you wonder if they actually dogfood their own stuff. A code platform shows a wrong diff – yep I couldn’t believe it myself so I tried again. #7040, #7045,Â #7060, always the same. Yes that’s right – the commits are ordered in alphabetical order BY HASHÂ or as I call it in “least useful order”. Not a single issue on the first page is related to Codeplex and it seems they don’t even care to close this spam. So why should I care to log issues there? 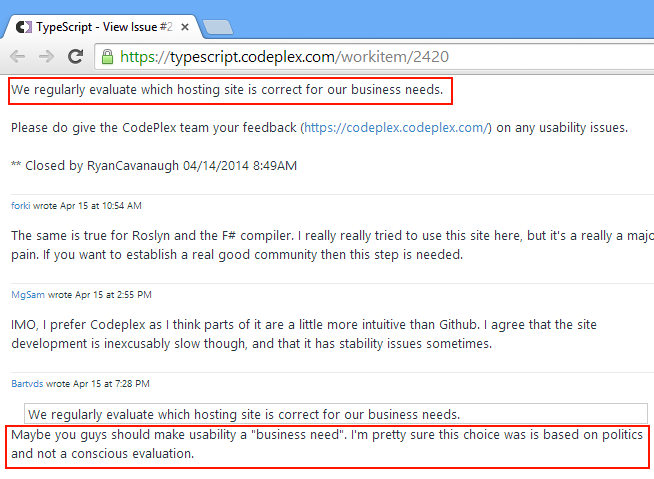 After reading thisÂ I really doubt it was the decision of the teams to use Codeplex. Fortunately the ASP.NET team seems to be an exception to this. Somehow they managed to move to github.com/aspnet. There are also other ways. Microsoft could really invest in Codeplex and make it a usable platform. But I don’t see this happing, because it will cost A LOT of money. Even if they would open source Codeplex I don’t see a community which is willing to improve this site. What are theÂ reasons for putting the Visual F# projectÂ on Codeplex, especially when the majority of the existing F# projects and communityÂ already operate on Github? Do you think it’s more important to support Codeplex or to grow a community around the programming language projects? If the F# community voted for the project to be moved, would you consider moving it? 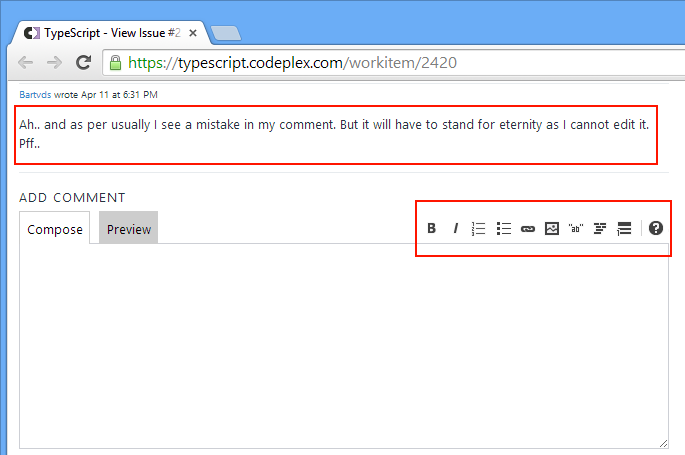 If you insist on Codeplex how and when do you plan to fix these usability issues? So please let your OSSÂ teams and their communityÂ pick the open source platform they want! With the FAKE 2.18.1Â we now haveÂ 80 contributors. A big thanks to all of you. Here are the most important changes since my last blog post about FAKE 2.14. More details about minor bug fixesÂ can be found in theÂ release notes. Two months ago I started to use the RELEASE_NOTES.md files feature in FAKE to describe FAKE’s own changelog. 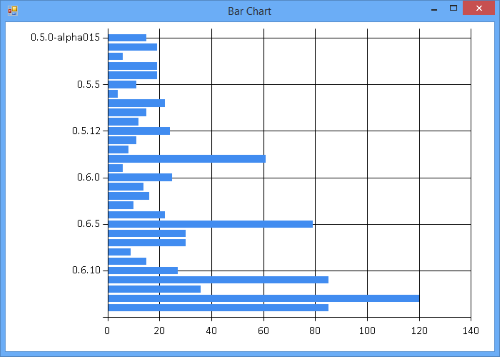 It’s working pretty well with FSharp.Formatting and the whole process got much easier for me. One of the intersting side effects is that I didn’t use the develop branch any more. Pre-release packages can be pushed directly from master. So in order to make it easier for new contributors I will follow standard git workflow and remove the develop branch completely. Please send your pull request directly to the master branch.